I can't say enough though about the last object of the night, M3. All winter we have just M79. Anyway, after gorging my senses on all of the objects in the linked post, I ended with M3, which was remarkable under the super transparent clear skies here. The last think I did last night before coming in after 2+ hours was revisit M3 once it was much higher up and used the set of ES 82* EPs I have. It was great in all magnifications, but special mention goes to the 4.7 mm, last EP of the night, where the magnificent ball of stars glided through while filling 1/5-1/4 of the field. I think I really like using high powers on nights of good seeing on GCs to enjoy the spectacular resolution many give and the sheer majesty and grandeur of how they look under those conditions. Went to bed a happy camper !! Now I'll have to give M3 some quality time in my next good session. I only glimpsed it once this year, just making sure it was still there on an average night. I just took a brief look at M3 last night, myself, b/c I had read some folks discussing it here on Cloudy Nights. I'm pretty new to Deep Sky observing because I live in the middle of a very light-polluted city. A few months ago I bought a Revolution Imager in a last-ditch attempt to get back something, ANYthing in the deep sky. It works! I've been looking at all kinds of stuff and having a lot of fun at it. It even inspired me to start (again) keeping an observing journal. I really like ending my night, as you did, with something that I know will probably be an easy target that makes me smile and say "wow." Last night, that was M3! M3 was one of many DSO I checked out this past Tuesday. Very beautiful, I just recently got a 10" dob and I drove out of town a little ways (class 4 bortle only 30 minutes drive from where I live) M3 is nice, I only have a 26mm 2 inch eyepiece for my scope at the moment, need to get a barlow lens or another eyepiece and viewing this object would have been incredible. Even as is, I could just barely make out so many thousands of stars. Guys, don't forget these coming nights if you do check out M3, also check out the asteroid Pallas which is fairly easy to find a bit west of Arcturus. Edited by jayrome, 29 March 2019 - 01:52 PM. M3 is one of my favorite globs. It really explodes with stars at a dark site and even 8" of aperture. This is how I saw M3 from my place, on the 10th of march, with a 8" reflector. 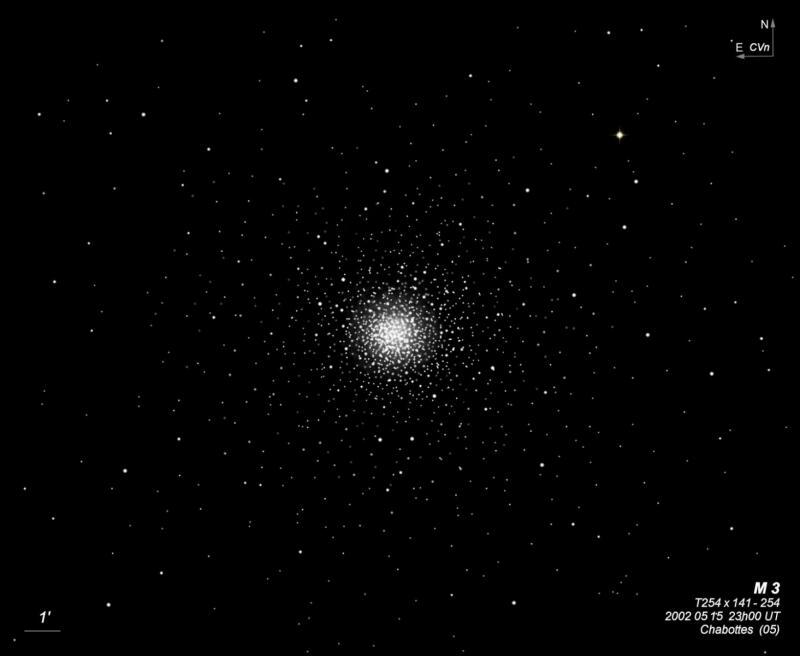 If where I live, with heavy light pollution I can see M3 like a cotton ball, I can Imagine how it will look on a dark sky. Nice. I viewed it last night in my 102ED. I caught M53 as well. Even got my first look at M13 for the year too. The interest of M3 is that it is in CVn. Thus it goes very high in the sky, and can escape a bit from pollution. Here is how I saw it in a good sky of southern french Alps (NELM 6.5v, SQMZ 21.6), and also some other ones.